You would think that all aspects of design would go with the vision that the hired photographer has. But let me tell you, I've seen some screw ups when it comes to how a client wants their day to be and then the photographer captures it completely different. I've actually been apart of those decisions. With my designs you would think that a client would want to pick out a photographer who edits their images bright and airy, right?? Not so right in many cases. For me and my designs it is best to have a photographer capture it with tons of light and then edits it in a bright way. In my opinion, if you have light florals you want to have that shown off. When lighter blooms are edited darker, it takes away from the contrast that the floral arrangement is trying to give off. For me it is easier to visually understand something so I have pulled some images that describe what I am talking about! Such a pretty BOHO wedding!! As you can see this photographer edits more of an "orangey" feel and bringing in tons of peachy colors. However, the bride chose tons of peach colors for her wedding so with her bouquet and her bridesmaids, it blended it too much with the pictures. There wasn't much contrast with the florals to show them off. EXAMPLE BELOW! When it comes to a more moodier bride, they usually tend to pick darker foliage and blooms. However, if you have very dark roses or different types of foliage, it is hard to tell what they are as they all blend together with the dark edit. Don't get me wrong here!- I think these are beautiful and these photographers and floral designers are beyond talented! It all depends on what your style is. If you are 'gung-ho' about showing off every aspect of your florals then I would go with a photographer that has amazing contrast and edits lighter. If you are a more 'moody' bride and want to add in a boho feel like the first two images, then a brighter palette and a photographer that pulls more peachey hues is the way to go! Now for how I recommend my clients to photographers if they are very picky on how the designs are captured. I recommend photographers who use tons of light and edit for a more brighter finish. Here are some examples below! Okay... these are fabulous. And did you know that each one of them are very different from each other on how they are taken and edited?? Photography is a beautiful thing my friends. For the first image that is of Rhiannon Bosse's arrangement, it is edited with a grey tint that makes those sweet little Eucalyptus' stand out! See how you can notice all of the florals? From the roses to the berries to give the arrangement texture, you notice them ALL!! With the second image, (which was by one of my favorite photographers that I work with in Texas and in Arkansas and I helped design this wedding with my one of my very good friends Anna Rogers of Magnolia Belle) everything is clear, bright, and gives off the exact color of that entire day! (and I can say that since I was there ;) )The grass is the same color, the girls dresses stand out with the southern robins egg blue (LOVE, btw), and since the florals are lighter it blends very well with how the image was taken. Now with the last image... this is just pure art. If my client is wanting a more 'paintery' feel with her images and florals, I tell them to go with a photographer who shoots film. This is exactly what Sally Pinera did. WOW. Just wow. The exposure, blurred background, and variegated greens make this image. I have worked with many photographers who shoot film and it is a harder job let me tell you. But man do they get the exact photo you want. If you aren't sure how to pick your photographer based on how you want your florals to be, schedule a call with me HERE and we can talk further on which would be the best option for you. OH, and I might give you some awesome recommendations!! Oooo I LOVE talking about color palettes. This blog is literally taking me back to high school art class. A ton of my clients come to me and usually are at a roadblock when it comes to choosing their palette. So I will show you 1.) which color palette speaks more to you and your personality and 2.) how to pick the palette that will blend perfectly together! First let's dive into what exactly the big deal is with color palettes and why everyone and their momma always asks you when you are planning a wedding. Color palettes are super important and the reason being is because usually everything else within your wedding revolves around it. Whether it be your bridesmaids dresses, wedding flowers, cake, linens, etc! The advice that I give my clients is that if their wedding date is in a specific season, have a color palette that is the opposite of that season. What the heck does that mean? ?- you may ask! 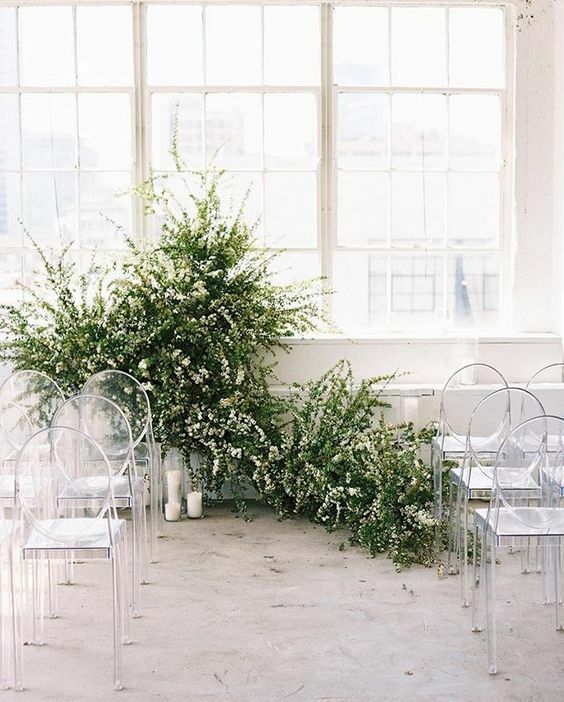 Well for example, if you are getting married in spring, everything is so bright and airy anyways, so I suggest for them to go with a more 'subdue' color palette. Subdue can mean a muddy tone, not as bright, and something very soft on the eyes. When a bride is wanting a fall wedding, I suggest going with tones that catch the eye and pop! Now to talk about the color wheel. We all know what that is! But some of us might be unfamiliar with the Analogous Color Wheel. Analogous is when you look at a color wheel and it is the 3 colors that are right next to each other. Using those three colors throughout your big day will have everything blending together perfectly. When you have two colors you want to use, you can also 'bridge the gap' by using a color that would be an in between color of those two. For example, If you are using a red but also want an ivory color, use a pink to bridge that gap. 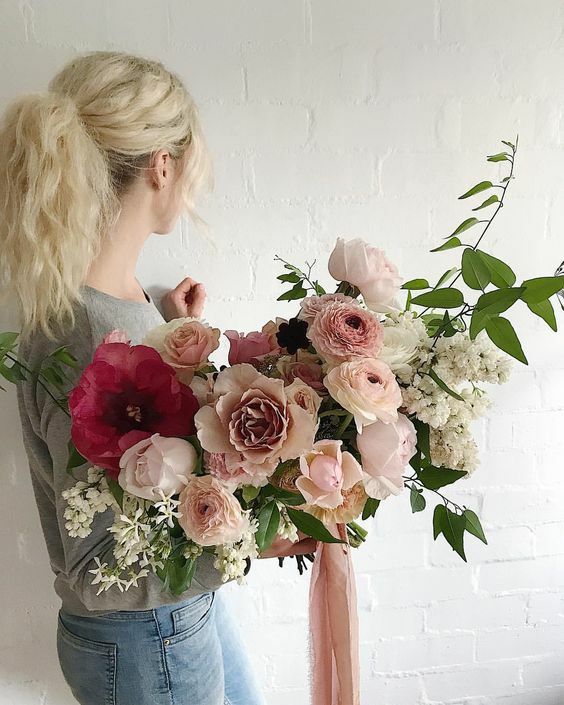 One of my favorite aussie floral designers, Cara Fich is super good at demonstrating this. See below! As you can see, there are darker blooms, white or ivory blooms, and then shades of pink that bridge that gap. This also makes the eyes wonder and also focus on how amazing they all blend together. Also, if a bride is a more 'romantic bride', I would highly suggest a color palette like this. SUPERRRR ROMANTIC!! If you are hung up on which color would be the best to 'bridge the gap' always ask your floral designer what his/her perspective is! I know you have been peeing your pants, waiting to see which color palette would be perfect for you and your big day!- so let's head on over to which one it would be! In my freebie "How to Create your Perfect Floral Arrangement" I describe different types of brides, which I will go off of! Romantic bride: pinks, ivory, touches of muddy colors, and a darker pink or red for contrast. Southern bride: YELLOWS ARE MY FAVE! yellow, whites, touches of robbins egg blue, and light light pinks. BOHO Bride: muddy colors. rust, browns, dark reds, and greens. Glam Bride: Bright colors. Orange, reds, and purples. Rustic bride: Purples, greens, ivory, and muddy colors. Usually when I am showing a client their visual proposal, I always go to Tono + Co's ribbons that show texture, analogous colors, and are just plain pretty. If you are stuck on what your color palette should be, don't get frustrated! You can always book a call with me!